Pomsky is a hybrid or ‘designer’ dog breed that is a cross between a Pomeranian and a Siberian Husky. Also known as a Pomeranian Husky. It looks like this cute Husky Pomeranian mix has taken social media and the internet by storm in last couple of years. And why not? This new designer breed is getting popular for a reason. It is one of the cutest dogs you will ever find. If you are looking to learn more about this amazing new designer dog, you are at the right place. You will find everything you are looking for about the pomsky dogs here. Welcome and thank you for stopping by our site dedicated to this wonderful cross breed called Pomsky. Whether you are a prospective parent or already a proud owner, our goal is to provide our readers with the most up to date information on the breed. We try to keep it simple & fresh, adding articles regularly and we try to keep it light and incorporate a lot of pictures. To be clear, we are not Pomeranian Husky breeders, however we do have a very coveted listing of Pomsky breeders so be sure to check it out if you are ready to bring one of these sweet puppies home! Check out the biggest list of Pomsky breeders on the internet. Let’s start with the little history and background. A Husky Pomeranian is a dog which has appeared in very recent years and gained huge traction and attention some time in 2013 for the obvious reasons – its cuteness and playful nature. Since it was only bred in the past few years there is not a lot of history and background available on the breed – things like life expectancy and potential health problems as these dogs grow older is not fully known yet. Also, due to the large differences in size of the Pomeranian and the Siberian Husky – careful attention must be paid to learn how the puppies are being bred. We have a great article on how the artificial breeding process actually is done. That being said, it is definitely a cute, fluffy, cuddly breed that many people would love to own. Below we’ve tried to detail as much information as possible for you on your quest to find your new puppy. The smallest of Pomskies weigh about 15 pounds – however note that they can get as large as 25+ pounds. Plenty of people admire Pomeranian Huskies because they look like a Husky but aren’t as big. But since it is a hybrid dog, their physical appearance is unpredictable and can’t be guaranteed. Yes, it is a bitter truth but if you are working with a trustworthy breeder, you can easily get a genuine Pomsky dog. Breeders are still working towards perfecting the look which is why you need to be careful if sellers try to make you unreasonable promises. Scam Alert: If someone claims their puppy will only weigh around 5-10 pounds when fully grown you should avoid making the purchase as it’s likely to be a scam. If someone is trying to sell it at a price that is much lower than the market price, another possible scam. Pomsky is a designer breed that is not cheap. If someone is promising a cheaper price, it is a red flag. To better determine features of a Pomsky dog, it's important to look at different generations. As of now, the cute Pomsky breed has five known generations. These Pomsky generations combine the Siberian Husky and Pomeranian breed in each parent. Knowing the generation will give you a better understanding of what qualities you should expect. For example, if the puppy is 50% Pomeranian and 50 % Siberian Husky then you’re likely going to get a larger dog. If the puppy is a 75% Pomeranian then you are looking at a smaller dog closer to the 15 pound mark. The Pomsky dog parents are only purebred. In the F1 Generation the mother is 100% Siberian Husky and father 100% Pomeranian. The F2 Pomsky Generation has two parents that are the same. This generation consist of parents that are both First Generation Pomskies. Pomsky is 50% Pomeranian and 50% Siberian Husky. There are also other variations such as F1b (Backcross generation), F2b generation (Second backcross generation) and Multigen, but you'll get the general idea. Ask the breeder for more details. Designer breeds are expensive, and Pomsky is not an exception. Pomskies are very expensive to buy since there are not many breeders around and because the methods of breeding a large dog with a smaller dog are costly. Certain physical features such as eye color and coat color will also affect the price. 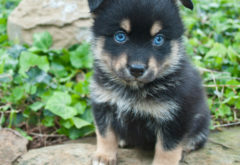 For example, blue eyes are more sought after and in return will increase the price of the puppies. If you would like to get your Husky Pomeranian shipped to you and your breeder provides that service then you would be looking at an additional cost of about $300-$500. As the demand for Pomskies grows and more breeders emerge, the prices for these designer dogs will eventually come down, but as of now they may be out of many people’s price range. You should also remember though that there are many costs associated with any dog not just the actual purchasing of the puppy! Aside from actually purchasing your dog you will need many supplies such as leashes, collars, and other accessories. You will also need dog toys and if you don’t buy them then you may find your Pomeranian Husky will make a toy out of your personal belongings such as socks and shoes. Tip: Toys are essential to keep your dog busy and even for some training methods. In addition, toys are generally cheaper than replacing furniture or other items. Another cost that comes with having any dog is definitely cleaning as they will shed and get fur all over your house which may be time consuming to clean up. If you dog’s fur is thick then you’ll likely need a groomer to keep your Pomeranian Husky’s coat clean as thick fur allows for more dust and dirt build up. Tip: Regularly brush your Pomsky dog to catch the weak hairs in the brush. This will keep your home clan of fur. Daily brush is better. Pomeranian Husky mix is also a very energetic breed and if you don’t have the time to take them out then you may have to consider hiring a dog walker. In addition to exercise you obviously need food to maintain your dog’s health and coat color, however good quality kibble and treats are not cheap. On average, food can cost up to $500 a year. As of now there are no known health issues with Husky Pomeranians however they still require normal medical expenses such as vaccines, dental cleaning and so forth. Medical bills can range from $40-$400 + a year. You could also consider getting an insurance for your Pomeranian Husky. Pomskies are quite playful and energetic dogs and they require foods full of protein and vitamins to allow them to live a long and content life. Just like with people dogs also require a well-balanced diet combined with exercise to ensure that they don’t end up with weight related issues. The quality of food is also vital as poor quality food and treats lead to sicknesses. Many owners’ select to feed their dogs dry kibble which are rich in proteins and contain less carbohydrates; a premium quality kibble combined with exercise should be beneficial in managing the weight of your dog. Vegetables are a great source of fiber and other vitamins which are essential to your dog, in addition grains provide plenty of energy carbs and meat provides protein and energy as well. If you want to give your dog treats, look to buy all natural products with little to no preservatives or chemicals. If a meat based treat has a bunch of wheat and soy, you should look at something else that has less fillers even if it’s a little more expensive as it will be better in the long run. Your new bundle of joy will also enjoy fresh fruits and veggies. Just experiment and see what he or she likes, some ideas include carrots, blueberries, or apple slices. If you don’t have time to cut up foods for your pup then you can also buy them chews or biscuits, once again go for all natural products as they will be better for your dog. Furthermore a treat doesn’t always have to be edible as your dog will enjoy playing a game or going for a walk too! To learn about more treats you can prepare for your dog, check out this article! Also, if you weren’t already aware, there are some foods which you should never feed your dog as they could be potentially harmful. Among those foods are: grapes, onions, chocolate and more, view the following article if you want to learn more about foods not to feed to dogs. The personality and temperament traits of the breed will be determined by his/her parent’s and it’s important to know that personality can’t be guaranteed just like with physical characteristics. It’s good to have an idea of how your puppy will act when grown up because you want to know what you’ll be getting yourself into and don’t want to buy a dog that’s not right for you! Continue reading below to find out about what Husky and Pomeranian temperaments are like along with what kind of personality you should expect when both dogs are bred. The Siberian Husky: is a gorgeous breed with a thick coat of fur that comes in a variety of colors and is known to be a very intelligent dog that can be trained. In addition Huskies are very athletic dogs and they require plenty of exercise or else they may get out of hand around your home. This energetic breed is also very playful and is friendly with adults and children, however they are also known to be escape artists and if you don’t have a fenced yard then there’s a good chance they may get loose. The Pomeranian: Although the Pomeranian is a tiny dog you shouldn’t let looks fool you because they have a wonderful, loving personality! They can be trained simply for obedience or in agility as well, however training can be difficult because if you allow your Pomeranian to pick up bad habits while young it may be hard to shake the bad behavior when older. Furthermore these dogs are curious and energetic which is why they like spending time being active so you need to be prepared to take your pup out and play with them. One temperament trait that many find undesirable is the high pitched barking; although Pomeranian’s often bark because they’re highly protective of their care givers and will bark if they feel something is wrong or see a stranger. As long as you take the correct measures to keep your best friend quiet when they start to get loud you shouldn’t have any issues! Finally onto the Pomeranian Husky mix and what traits they inherit from their parents. Pomeranian Huskies generally have many of the favorable traits from their parents. For example they are known to be quite intelligent and playful just like a Husky. They will also require attention and need exercise or else they will become destructive around the house and make toys out of whatever they can find. In addition, Pomskies will require training and may have a higher pitched bark – however they are also very loving and protective of their owners like Pomeranians. Pomskies are known to be intelligent and playful dog. Learn more about Pomsky temperament traits. The Pomeranian Husky has a beautiful coat that is soft and also thick which is why they require extra care. You should keep in mind that even though Pomskies are smaller than Huskies they can still shed a lot of hair. Pomskies go through 2 shedding stages per year and each period lasts for around 90 days. Regardless if your dog is shedding or not, their coats must be brushed normally to maintain a great look and health. Since this designer breed has a double-coat they can better adapt to cold climates which may be beneficial to you if you live somewhere that gets considerably cold during the winter. Watch Out For Puppy Mills! If you’re out searching for a new puppy to bring home pay close attention to some of these tell-tale signs that can be red flags for a puppy mill in disguise. What is a Puppy Mill? For those who aren’t aware, a puppy mill is essentially a dog factory – These so called breeders are trying to churn out puppies as quickly and efficiently as possible without having a care in the world for the well-being of any of the dogs in question. They are after one thing and one thing only and that’s profits, so their decision-making ability is jaded by the dollar signs. It’s not hard to avoid puppy mills when searching for that cute new Husky Pomeranian mix to bring home, just be vigilant about a few things. First off, any reputable breeder will allow you to meet the parents of the puppy. Especially with new born puppies, the parents will still be around so a breeder should have no problem in allowing you to see the parent dogs and how healthy they are, how big they have grown amongst other things. Further to this, if the breeder you are purchasing the puppy from does not allow you to visit their kennel walk away immediately. Any proud breeder will be happy to have you at their facility to show where the puppies are bred, where they are kept, where they eat. You can see their living conditions and where they have spent the last few weeks or months growing up. You want to make sure the facility is clean and has state licensing if necessary. Walk away immediately from any breeder who hesitates to allow you to see their kennel when picking out your new Pomeranian Husky puppy. For more information on puppy mills read our article – 5 Signs Your Puppy Is From A Mill. The Pomeranian Husky, along with other hybrid breeds, is not acknowledged by the American Kennel Club. The Pomsky Club of America and the International Pomsky Association are two major resources at the moment. The PCA has a code of ethics and a couple of breeders listed and the IPA also has a code of ethics and even more information, for example they offer registration, tracking, and breeder education. What size is your F2 pomsky? How many pounds?